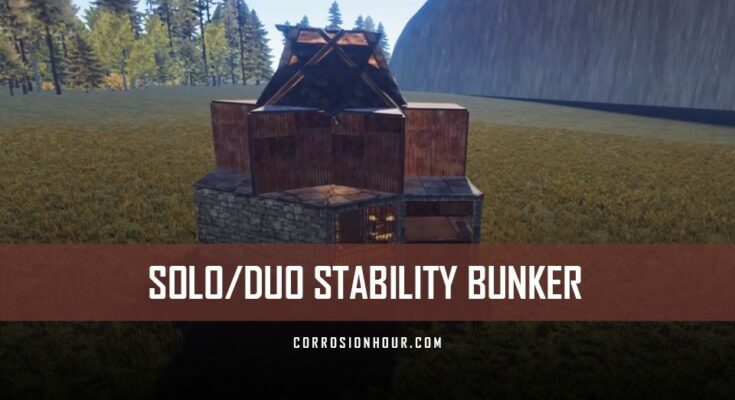 Kicking off the new year on the right foot, our partner Everherd introduces his new solo/duo stability bunker RUST base design. 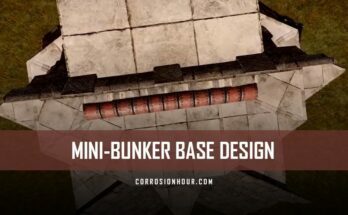 From the onset, this base has a smaller build profile, but raiders will be surprised to find a fortified core inside, requiring more explosive power than expected. Regardless of the raiders directional approach, this base design requires a minimum of 11 C4 to gain access to the tool cupboard. The main entry utilizes a prison cell gate at the front of the airlock, with two garage doors behind it. One door leads into the base core, while the other allows for a loot box or optional auto turret to be placed. Past the main airlock is two shop fronts, allowing for a large degree of visibility outside of the entry. When used in conjunction with the optional auto turret, you can easily clear the entry area of enemy players. Going deeper inside the base are the typical amenities you’d expect of base design, allowing for just enough storage and space for furnaces. Ok, so just before we start the video I just want to thank you all for 500 subs, it really means a lot to me. Ok so as we come inside we have a prison cell gate. This is so we can shoot out while having some protection. You also have a turret that we can open from inside. Like this, you can see that the garage door kind of sticks out. We’ve also got two shop fronts that you can look out. On this side we’ve got a re-spawning room, in there we’ve got a locker as well as a two bags. In here we’ve got a work bench, some furnaces, as well as a few bags. So lets go down to our bunker. To get out of the bunker, you just want to break this half wall as well as this floor. Then you can just get out with the ladder. Like this, I mean, like this, I mean, like this. Its a lot easier than it looks, I always make things look hard. To close up the bunker, you just want to close up the half-wall right here. Then you want to take out this window and place a floor right here and you also want to place a floor above it. You’ll want to upgrade this one to armored and this one to wood. Also you’ll want to repair the window when you replace. Also you have a shotgun trap so if someone tries to break the window, he’s gonna be in for a nice surprise. You might also want to upgrade this to wood and place a box in there. You might also want to keep them unlocked so raiders don’t think about breaking the garage door. Best case scenario is they go through the other doors before they notice it. Ok, so we want to start off with a triangle circle. You want to upgrade your foundations to sheet metal. And you want to place in windows like this. Walls all around this stuff. Upgrade these two to armor. Upgrade the rest of it to sheet metal. Then place in your windows. Place a half-wall on top, also make it armored. Then you’ll want to make a wall on this side and place a ladder on it. Add a foundation on the opposite side and add a staircase to it. This is going to be your temporary way in. If you have high quality already you can update these walls now. Also make sure to rotate the wall, I actually placed it the wrong way around. You can actually upgrade the ceiling to stone, since we’re going to be placing another layer of honey combing anyways. Now lets build our bunker. You can do it in a different way, but I did it like this. Now here you can place a second bag or some furnaces. It doesn’t really matter, you can also place in some boxes. Now you want to make sure you can place a bag inside, because you want to make sure you can spawn inside to open it up. And again this is how we close it up. Also you only want to close it up when you are going offline, otherwise you’re going to be wasting a lot of high quality if you do that. The interior on this one is going to be a little different than the other one. This time I’m going to place the bunker in the back with two regular loot rooms with a secret under one of them. Now your work bench you can pretty much place it anywhere, I just placed it down near one of the loot rooms. Keep a work bench close by so you can pick them up and replace them when you need to. You can do the interior anyway you like it. You’re also going to want some furnaces. You want to keep these boxes that are hiding the bunker unlocked so that no one thinks about raiding it. You can use normal doors, but I recommend using garage doors. Now you just want to add a triangle on the back to hide the window. This is the first stage of the base. Now is the time to expand out. We’re gonna add some honey combing, as well as a re-spawn room and a little bit of an airlock. The foundations that are touching the main circle we want them sheet metal. The outer foundation you can just leave as stone. We also want to upgrade this wall to armored, otherwise people can just go through it and get a cheap entrance to the bunker. You actually don’t want to place a floor here, this is going to be your entry to the bunker. The wall frames you can leave as stone, it doesn’t really matter. Now we’ll add our second level of honey combing. If you’re really paranoid, you can make it sheet metal, but I would recommend just making it stone. This part right here though, we want to make it sheet metal, otherwise people can skip a few doors. Now of course, we need a role player roof. You can place it from the inside, but you might want to just wall yourself in like this. Ah yes, it’s already looking beautiful. Now I am going to use bgrade, just so that it’s a little quicker while placing the honey combing and this is pretty much it. Remember to smash that subscribe button as well as the like button. I’d also really appreciate it if you’d join my discord. So anyways, see you guys in the next video.